Defending the castle is a coach favourite at Little Kickers. It is an energetic game that can be incredibly animated. The children are tasked with trying to protect the castle from the naughty Coaches. The children are told they are going to break their castle by kicking big cannon balls (footballs!) at their castle! 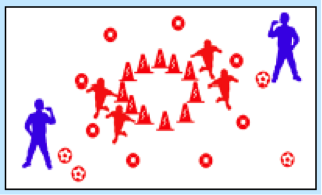 The Benefits: Children work together to move around the Castle protecting the ball from passing through. Not only do the children have to communicate to stop gaps appearing, but they also have to be decisive in their decision making to move to protect the castle. It is awareness of three dynamics; space, opposition & team mates. When the children are then asked to become the attackers, it also works on their perception of space, seeking opportunities to hit a target, dribbling and accuracy.